Thanks to the Bellevue Rotary Club World Community Service Grant Committee of Seattle, WA, one of the classrooms in the two finished pavilions of the La Carreta secondary school will be used as a computer classroom. The room needed to be air-conditioned in order to keep computers working in the high heat and humidity of Nicaragua. That necessitated, in addition to the air-conditioning unit, insulation of the ceiling, special aluminum+glass windows, 2 doors of similar heat-resistant material, (to replace the standard metal doors and standard metal gratings in the window openings), and electrification of the room with multiple outlets for the planned 15 computers. Students started attending classes at La Carreta when the Nicaraguan school year started in March. their “summer vacation” being in December-February, similar to the old “coffee schedule” of Hawaii’s public schools, and the computer room habilitation was planned. On April 15, 2016, we found out that our grant application was approved, and our master builde, Marvin Abad, began work on the special room project. 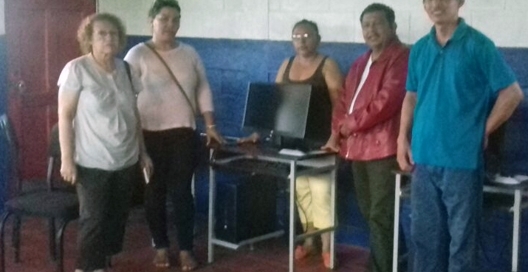 Somos Ohana Nicaragua’s 2016 summer team expected to bring 10 donated computers for the room, but we were thrilled and grateful to find out in May that the President of Nicaragua was sending 10 new computers along with desks and chairs for their stations. Since then, that office has promised another set of 5 additional. These gifts mean that we can designate our 2016 computers to the other schools and take one each to our 3 new college scholarship recipients. 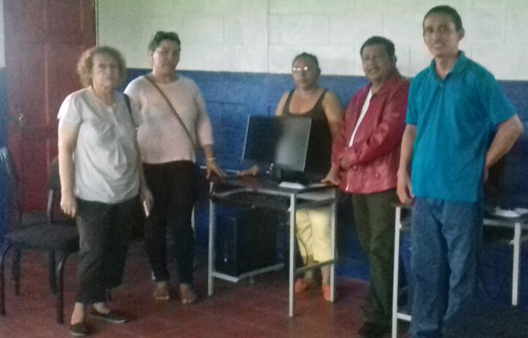 In early June, a delegation from the Ministry of Education and the partner Rotary organization, the Rotary Club of Chinandega, Nicaragua, visited the school and celebrated the “almost-completion.” Full completion awaits the installation of the electrical transformer. Our first secondary school operated for a year or more with no electricity. La Carreta has electricity to building, but needs to step up the power for the computer room’s AC unit. Picture above shows 3 Rotarians from Chinandega making their official visit to La Carreta with 2 of the teachers (woman in black blouse and man in blue shirt). Computer equipment, desks and chairs from the President’s office can be seen in the photo taken in the computer room.